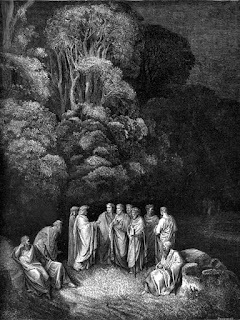 Last week Virgil and the Pilgrim entered Limbo and we discussed who, in various church traditions, might have ended up in Limbo. Here's a related question: Is Limbo in the Bible? As many of you know, the Bible isn't consistent in how it describes the afterlife. In the Old Testament the place of the dead is called Sheol. Sheol isn't hell, but it looks a lot like Limbo. Not really a place of punishment, but a place of stasis. In the New Testament, Jesus doesn't really speak about "hell." Jesus mostly speaks of Gehenna, a location outside the walls of Jerusalem, and Hades, the place of the dead. Many scholars think Hades is the equivalent of Sheol. To make things even more complicated, 2 Peter 2.4 mentions Tartarus as a place of punishment for disobedient angels. Jesus tells the thief on the cross, "Today you will be with me in Paradise." And where, exactly, in the Parable of Lazarus and the Rich Man, is "the bosom of Abraham"? Are all these references--Sheol, Gehenna, Hades, Tartarus, Paradise, the bosom of Abraham--referring to the same place or different places? And which refer, if any, to hell, that place of everlasting punishment? Some of this puzzle has to do with timing, specifically the timing of your death and the Final Judgment in the future. Most traditions believe that Final Judgment, where humanity is sent to either heaven of hell, is at some point in the future. If so, where do the dead go to await the Judgment? Answers vary. Some traditions believe that the dead are "asleep." Some call this "soul sleep." But "sleep" is just a metaphor. The dead are actually dead. There is no continuing consciousness. In this view, the dead are dead until the General Resurrection when they are brought back to life again. Metaphorically, the sleepers awake. Other traditions, however, believe that the soul is immortal. In this view the soul can't really die but is, instead, translated into another realm after death. This "other realm" can't be heaven or hell, not in any final sense, since that sorting still lies in the future at the Final Judgment. So what is this "other realm" that functions as sort of "holding tank" for souls awaiting the Final Judgment? Well, that's where Limbo comes in. Some traditions think Sheol and Hades is Limbo, a place where the dead reside before Judgment. But that doesn't solve all the problems. Is Limbo the Paradise Jesus describes on the cross? Also, in the Parable of Lazarus and the Rich Man immediately upon their deaths the rich man is in torment in Hades and Lazarus is in comfort in the bosom of Abraham. That doesn't seem like Sheol or Limbo, a neutral space holding the dead. In Jesus' parable it seems like some sort of moral sorting occurred at the point of death (or just after), well before the Final Judgment. So is there some sort of pre-sorting that happens in anticipation of the Final Judgment? And if so, why would there be any need for a Final Judgment if everyone had already been sorted? It's all very, very confusing. Next week we'll get to how Dante fits this puzzle together.